Towards the end of the summer, crates of tomatoes are sold at very low prices. This is the perfect opportunity to buy a large quantity and stock up. In addition, it is an original activity to do with family or friends! 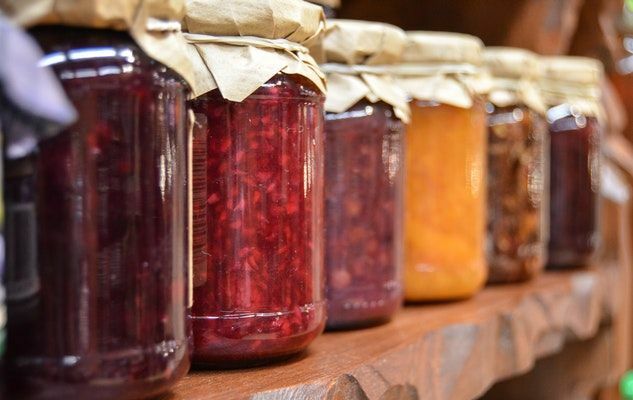 I recommend you read our article on how to safely preserve food, because there are some important precautions to take. You will be delighted to have beautiful tomatoes! If you are a subscriber to our meal plans, you have probably already prepared roasted peppers. Did you know that you can freeze them? It’s easy enough, I invite you to follow this method. You can then prepare our recipes for Quesadilla with Peppers, Avocado and Turkey, Simplified No-Crust Quiche and Potato Salad with Roasted Red Peppers in no time at all! What to do with all the herbs you have grown in the summer? Use basil to make some delicious pesto that you can freeze in ice cubes. Turn your parsley into our Parsley and Garlic Base that you will use in many of our recipes. For other tips, check out our article on how to store fresh herbs. Did you know that blueberries, strawberries and raspberries freeze very easily? Wash them, dry them and spread them on a baking sheet covered with parchment paper. Once frozen, put them in freezer bags. Simple as everything! The berries will be excellent in a crisp or a smoothie. Take advantage of the summer bounty to make a succulent compote. Once frozen, it can be kept for up to 4 months. Try our recipe of Plum Compote. What foods will you keep this year? Let us know on Facebook, Instagram, Twitter, Pinterest or in the comments below! Oh, and I forgot to mention that there are many herbs used as spices that can help too. Parsley and cilantro and basil are three (though I haven”t found cilantro or basil to be that helpful), some say rosemary and similar “pine smelling / resinous / turpentine-like herbs, and citrus peels. I”m sure there are others! I’ve already canned berries, etc. as they came ripe (chokecherry syrup, crab apple butter, crab apple sauce, crab apple juice, saskatoon berries, stewed rhubarb) – but I like to do pears and peaches when they arrive from BC as well. Last year I discovered that you don’t have to peel pears before canning – and they’ll do just fine canning them in water rather than syrup. What a time saver!